Mangaluru, June 22, 2016 :According to information released by Railways, the construction of a subway between Mangaluru Junction and Padil will disrupt train service ontoday June 22, Wednesday from 1.pm to 7pm. Accordingly, there will be a partial cancellation of Mookambika Road Byndoor-Kasargod passenger train (56666/56665). Madgaon-Mangaluru DEMU (70105/70106) will be partially cancelled between Thokur and Mangaluru Central. CSTM-Mangaluru Junction express (12133) will run via Thokur and Bantwal and arrive at Mangaluru Junction 45 minutes late. Mangaluru Junction-CSTM Express (12134) will run via Bantwal and Thokur and run 60 minutes late. 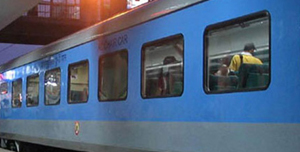 Yashwanthpur-Karwar express (16515) will be regulated from 6.10pm to 7pm and will be late by 50 minutes to reach Thokur, a Konkan Railway Corporation communique stated. conducted a special drive with his team at Karwar railway station on Monday. During the course of the drive, RPF staff of Konkan Railway checked the general coach of CSTM Mangaluru Express (12133) at Karwar station and found four carton boxes containing 375 Goan-made liquor bottles valued at Rs 11,000. Karnataka has one major Port at New Mangalore and 12 minor ports at Karwar, old Mangaluru, Belekeri, Tadadi, Honnavar, Bhatkal, Kundapur, Hungarkatta, Malpe, Padubidri, Manki and Mavinakurve. DIG K R Suresh, Commander, Coast Guard Karnataka who chaired a safety meeting at Maritime Rescue Sub Centre stated that merchant vessels not adhering to safe and expeditious passage on laid down shipping traffic lanes pose safety and maritime security threats. ICG, Indian Coast Guard and other maritime security agencies monitor the international shipping traffic. During the ongoing monsoons, sea conditions are rough and safe transit of international merchant vessels is important to avoid unwarranted mishaps on our coastline and coast. Karnataka has 320-kms long coastline and a major portion of trade and commerce both national and international, is routed through sea routes off the state. ICG ships and craft will monitor vessels anchored and sailing, anchored outside port limits and awaiting orders for next Port, proceeding for demolition without prior intimation. Merchant vessels transiting through India’s EEZ should participate in Pre-Arrival Notification and Indian Search and Rescue System. Anchoring in territorial waters without PANS/drifting for undergoing repairs in undesignated areas should be with prior information and closely monitored. Vessels flying the Indian flag as well as all port communication centres and vessel traffic management centres are encouraged to report such vessels to nearest MRSC to monitor and document. The MRCC will take up information of such vessels with Director-General shipping at Mumbai for issuance of advisory. Cases of various merchant vessels taking shelter without prior intimation around islands of Karnataka/Lakshadweep and Minicoy have come to light.